The ceaseless fascination with ancient Egyptian art and civilization during the revolutionary age of the "heretic" pharaoh Akhenaten (r. 1353-1336 B.C.) and Tutankhamun (r. 1332-1322 B.C.) continues to inspire extensive research and the publication of quality color-illustrated studies. Suitable for students, scholars and enthusiasts, many are exhibition catalogues authored by world-renowned museum curators and art historians. Most are available in bookstores and through Internet retailers. * Shaw, Ian (ed.). The Oxford History of Ancient Egypt. New York: Oxford University, 2000, 218-313. * Hawass, Zahi. Tutankhamun: The Golden King and the Great Pharaohs (exh. cat.). Washington, D.C.: National Geographic, 2008. * Freed, Rita E., Yvonne E. Markowitz and Sue D'Auria (eds. ), et. al. Pharaohs of the Sun: Akhenaten, Nefertiti, Tutankhamen (exh. cat.). Boston, New York and London: Bulfinch Press/Little, Brown and Company, 1999. * Kozloff, Arielle P., Betsy M. Bryan, et al. Egypt's Dazzling Sun (exh. cat.). Cleveland: Cleveland Museum of Art, 1992. * Silverman, David. P., Joseph W. Wegner and Jennifer Houser Wegner. Akhenaten and Tutankhamun: Revolution and Restoration. Philadelphia: University of Pennsylvania Press, 2006. * Aldred, Cyril. Akhenaten, King of Egypt. London: Thames & Hudson, 1988. * Arnold, Dorothea, et al. The Royal Women of Amarna (exh. cat.). New York: The Metropolitan Museum of Art, 1997. * Redford, Donald B. Akhenaten, the Heretic King. Princeton: Princeton University Press, 1984. * Reeves, Nicholas. Akhenaten: Egypt's False Prophet. London: Thames & Hudson, 2001. * Smith, Ray Winfield and Donald B. Redford. The Akhenaten Temple Project. Warminster: Aris and Phillips, 1976. * Ziegler, Christiane (ed.). The Pharaohs (exh. cat.). New York: Rizzoli International Publications, Inc., 2002, 466-469. * Trope, Betsy Teasley, Stephen Quirke and Peter Lacovara, et al. Excavating Egypt: Great Discoveries from the Petrie Museum of Egyptian Archaeology, University College London (exh. cat.). Atlanta: Michael C. Carlos Museum, 2005, 67-78. * Amenta, Alessia. The Treasures of Tutankhamun and the Egyptian Museum of Cairo. Vercelli: VMB Publishers, 2007. * Desroches-Noblecourt, Christiane. Tutankhamun: Life and Death of a Pharaoh. New York: New York Graphic Society, 1963. * Edwards, I.E.S. The Treasures of Tutankhamun (exh. cat.). London, Thames & Hudson, 1971. * James, T.G.H. Tutankhamun. New York: Metro Books, 2002. * Reeves, Nicholas. The Complete Tutankhamun: The King, the Tomb, the Royal Treasure. New York: Thames & Hudson, 1995. * Allen, Susan J. Tutankhamun's Tomb: The Thrill of Discovery (Photographs by Harry Burton) (exh. cat.). New York: The Metropolitan Museum of Art, 2006. * Wonderful Things: The Discovery of Tutankhamun's Tomb. New York: The Metropolitan Museum of Art, 1976. Praise to You who rise in gold and illumine the Two Lands by day at your birth. Nut your mother has borne You on her hand, and what the Aten encircles is bright because of You. Great Illuminator who shines forth from the Primordial Water, may my Ka be sustained with food and provisions. Power of Powers, greatly majestic in the Night Bark, mightily eternal in the Day Bark, may I be glorified in your domain, may You cause me to endure in the West. May You ignore my wrongdoing and set me as one honoured. May You protect my Ba in the Sacred Land, that it may go about in the Field of Reeds, because I have passed on with joy. Throughout history, Nubians have managed to keep their traditions and lifestyles relatively uninflected by outside influences, and yet they have still interacted with different cultures surrounding theirs. Although many Nubian villages had to be resettled elsewhere due to the impending need to build both the Aswan and High Dams, some fortunate settlements have stayed put in their original locations. Such is the case in the area west of Sihail. Due to its privileged location, for many years investors tried unsuccessfully to purchase these lands, in a bid to build hotels that would have no doubt become renowned because of the impressive views they would have offered, the breathtaking sunrises guests might have witnessed as the Nile spread before them. Still the Nubians refused to sell. One may wonder at first what changes have caused the Nubians -- traditionally cautious of foreigners -- to now begin to more warmly welcome tourists on their lands. Archaeologists working around the Mediterranean met two weeks ago in Cairo to discuss intercultural relations between the countries of the region. The conference focused on theoretical and methodological issues related to the study of intercultural contacts in archaeology on the one hand, and on actual case studies of intercultural contact on the other. Papers presented at the meeting dealt with a wide variety of topics, including the methods and theory of the study of contacts in archaeology, immigration patterns in different countries including Egypt, trade and exchange, the import and local imitation of foreign objects, the adoption of foreign religious ideas, influences in artistic and architectural styles and seafaring. 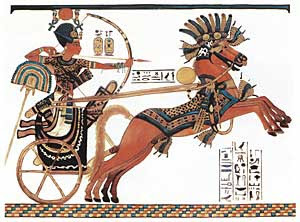 Although ancient Egypt is often seen by the wider public as a unique, united and rather isolated culture, the presentations made clear that Egypt had many and far- reaching contacts all over the Mediterranean. Not only did Egyptian objects and ideas reach the furthest corners of the region, but Mediterranean people, ideas and objects were also welcomed in Egypt itself. Owing to archaeological discoveries and research, it is now seen that ancient Egyptians were in contact with their neighbours from prehistoric times and not, as is often believed, only since the Open Door policy opened up trade with the European Union. To illustrate these connections, on the fringe of the conference the Netherlands- Flemish Institute in Cairo (NVIC) has mounted a panel exhibition on intercultural contact between ancient Egypt and other countries of the Mediterranean. The exhibition, entitled "Ancient Egypt in the Mediterranean" and held in the garden of the Egyptian Museum, was opened by Zahi Hawass, secretary- general of the Supreme Council of Antiquities (SCA) and will last until the end of December. It highlights the friendly relationship between ancient Egypt and its neighbouring countries around the Mediterranean Sea, as well as telling the story of foreign groups who lived in Egypt in ancient times. The exhibition displays the far-reaching influences Egypt had on its neighbours and its involvement with regard to the trade routes of the ancient Mediterranean, together with how ancient Egyptians adopted foreign technologies and ideas. "An ancient, esoteric time bomb." The murder of an Egyptologist rings alarm bells with the US Department of Homeland Security. Before he knows it they co-opt his son, controversial British historian Anson Hunter, into an investigation that has stunning implications for US security. The search catapults Anson, Kalila, a Coptic Egyptian girl, and an intelligence team into a race through the length of Egypt, yet soon their search attracts the attention of radical Islamists as well as the Egyptian authorities. Dark suspicions surface, suspicions that Anson’s father found evidence of a secret that will shake the foundations of every major world religion. Soon, whichever way they turn, Anson and his team find themselves trapped in a labyrinth of intrigue and menace that becomes too hideously real. Anson Hunter’s special knowledge as an alternative Egyptologist, theorist and phenomenologist could be the key to stopping a catastrophe. The Andrew W. Mellon Foundation has awarded 250,000 US dollars to help York University make academic research material available online. The project will allow researchers to link their work to databases, video, audio and other information as well as stimulating academic debate. The latest research will build on work completed as part of an earlier award-winning project, Linking Electronic Archives and Publications, or Leap, which won Best Archaeological Innovation and was highly commended in the Best ICT Project category at the 2008 British Archaeological Awards. The project will run until March 31, 2011. Internet Archaeology, hosted by York University, was established in 1996. It has over 70,000 hits per day to its pages from more than 120 countries. DMA Offers Cheaper Tut Tickets on Anniversary of Discovery: Howard Carter opened the undisturbed tomb of King Tutankhamun on November 26th, 1922. Just for today, the first 100 visitors to buy Tut tickets at the Dallas Museum of Fine Arts box office can get them for $19.22 each to commemorate the event. The Museum: A 10-part BBC production kicks off with a peek into the lives and work of the British Museum conservators, who spend countless hours repairing, cleaning and restoring the museum's astonishing collection. One fellow describes repairing flecks of paint on an ancient Egyptian wall painting as terrifying - "one slip and 3000 years goes". redevelopments, and the ethics of displaying Egyptian human remains." fundraising application, stressing the need to overhaul the existing galleries." will be available to view through the web version of the catalogue." More than half a century ago, a prominent Egyptian archaeologist unearthed a stunning ancient mummy mask at the Saqqara pyramids near Cairo — the golden image of a noblewoman's face. Mohammed Zakaria Ghoneim deposited the 3,200-year-old relic in a warehouse at Saqqara, where he meticulously documented his discovery. Seven years later, in 1959, Egyptian records show it was still in the same storeroom. What happened to the burial mask of Ka Nefer Nefer in the four decades that followed is a mystery. It resurfaced in 1998 when the St. Louis Art Museum acquired it. And now it is at the center of one of the most acrimonious fights in the antiquities world. The case lays bare the complexities involved in growing efforts by Egypt and other countries to reclaim artifacts stolen or looted from their ancient civilizations. The simultaneous exhibition of tomb relics from China's first emperor and ancient Egypt's boy king will have a royal economic impact on Atlanta, officials projected before the exhibitions launched. “King Tutankhamun: The Golden King and the Great Pharaohs,” will bring an estimated $150 million in spending to the metro area, said William Pate, president-elect of the Atlanta Convention and Visitors Bureau. “In tough economic times, this is going to provide a great stimulus that will help attract visitors from all over the country and all over the world,” Mr. Pate said in prepared remarks at a media preview Nov. 10. “Those visitors are going to rent hotel rooms, they’re going to eat in our restaurants and they’re going to be going to the other fine attractions that Atlanta has to offer,” he said. The exhibition began Nov. 15 and is hosted at the Atlanta Civic Center in partnership with Emory University’s Michael C. Carlos Museum through May 25. Middle Eastern luxury, circa the second millennium B.C. The Metropolitan Museum of Art has assembled another spectacular examination of Middle Eastern history, this one filled with some 350 objects made of gold, silver, lapis lazuli and other precious materials, including a haul of 3,400-year-old luxury goods found in the wreck of the oldest seagoing vessel ever discovered on the bottom of the Mediterranean Sea. The museum has even recreated the vessel's hull, complete with fore- and afterpeak, around the gallery holding the find. Museum design rarely goes farther to set the scene. "Beyond Babylon: Art, Trade, and Diplomacy in the Second Millennium B.C." is more than just a treasure show, and the boat is more a symbol than a stage set. For the theme of this show, like that for a number of recent exhibitions set in the ancient history of the Islamic crescent (which stretches from Lebanon and Turkey across the lower continent of Asia to India), is the long historical record of internationalism in the region. And the sunken ship, which dates to the 14th century B.C. and was found off of Uluburun in southern Turkey, is in fact a perfect illustration of the trade that made this multicultural world swim. Among its 17 tons of cargo were ten tons of copper ingots, and one of tin (tin and copper melted together give you bronze, and this was, after all, the middle Bronze Age), both represented here by examples. There were also glass ingots for industrial use, and ivory and ostrich eggs from Egypt, ebony from Nubia, and Canaanite jars filled with resin for cosmetics. Altogether there were products from 12 separate cultures stretching from Sicily to the Baltic to Central Asia, not to mention the polyglot passengers, who included (judging from their weapons and jewelry) Canaanite merchants, two noble Mycenean envoys on their way back to Greece and an elite mercenary to oversee the cargo. Beyond Babylon: Art, Trade, and Diplomacy in the Second Millennium B.C. is at the Metropolitan Museum of Art, New York, through March 15. TWO MONTHS after UNESCO agreed on a design proposed by French architect Jacques Rougerie for the first underwater museum of Egyptian antiquities on the Mediterranean coast in Alexandria, a mission from the European Institute for Underwater Archaeology has begun carrying out a feasibility study to examine the best procedures for its construction. Zahi Hawass, secretary-general of the Supreme Council of Antiquities (SCA), said the study was being carried out under the supervision of UNESCO, that would also follow step by step all construction work of the planned museum. According to Rougerie's design, the museum will consist of a three-storey building. One storey will be onshore, another offshore and the third under the waves along with a large open-air terrace to act as a window so that visitors to the museum will be able to view Alexandria's Eastern Harbour. This will be decorated with four tall glass structures resembling the sails of a boat, which, according to Rougerie, will recall the lighthouse of Alexandria that illuminated the library and the world. The satellite imagery available through Google Earth is a valuable resource for archaeological research. The program is free for download from the Web. Use the Latitude and Longitude coordinates for the archaeological sites included in the EES Delta Survey in Google EarthTM and the viewer will take you to that location. A few areas of the Delta are at present only photographed at low resolution, but the majority is available in good-quality images. These show the present size of the sites, their surroundings, areas lost to cultivation or other development and any ancient or modern buildings. The Museum of Fine Arts, Boston presents Secrets of the Tomb: Egypt 2000 B.C. from October 18, 2009 to January 10, 2010. The exhibition introduces the viewer to the Egyptian concept of the afterlife through the funerary equipment of Djehutynacht, a local governor, and his wife during the civilization's Middle Kingdom period (2040-1640 B.C.). Discovered by the MFA, Boston during a 1915 joint excavation with Harvard University, Djehutynacht's tomb, previously disturbed by robbers, contained the official's painted severed head, four decorated sarcaphagi, canopic jars, jewelry, walking sticks and other adornments. Some 60 different model boats were founded with two dozen wooden facsimiles of shops for bakers, brewers, brick-makers, carpenters and weavers, all representing aspects of daily life in ancient Egypt. The objects were awarded to the museum in 1921 and suffered slight water damage while aboard a transport ship that caught fire. Usually only the famous Bersha Coffin and Procession are on display in Boston. The exhibition includes the remarkable finds from Djehutynacht's tomb as well as royal and other statuary from collections of Egyptian art worldwide. The Canadian Museum of Civilization in Gatineau, Quebec presents Tombs of Eternity: The Afterlife in Ancient Egypt from December 19, 2008 to August 16, 2009. The exhibition explains the Egyptians' concept of death not as the end of life, but as the beginning of immortality and what they did to guarantee their eternal existences. More than 200 funerary objects from the Museum of Fine Arts, Boston are supplemented by artifacts from the CMC. The mummified human and animal remains, sarcophagi, amulets, jewelry, pottery, sculptures and monumental works of art on display describe the Egyptian nobility across 3000 years of pharaonic history. The installation includes a recreation of a tomb. A number of issues have been raised lately regarding the urban renewal program in Luxor and its effects on the local population, tourism, antiquities preservation, and the archaeological community. The Epigraphic Survey of the Oriental Institute, University of Chicago based at Chicago House is one of many archaeological missions in Luxor which has borne witness to and been impacted by these changes, and is one of the many voices of the scientific community here who have joined in the development conversation between the city, the SCA, archeological missions, and the local population since the inception of the program by the city several years go. The community of archaeologists in Luxor has been far from silent during this whole process. We may not have been very effective in curtailing some of the more onerous aspects of the present program, but we have certainly not been silent. The development program for Luxor, including many of the artists' projections of the changed landscape shown in the web site above (many of which have already happened) was announced to the archaeological community in 2006 in a PowerPoint presentation given by Luxor governor Dr. Samir Farag at the Luxor Museum, after which there was a fairly lively discussion among those present; I was one of them. During the discussions it was made clear that the programs planned for the antiquities sites themselves were designed by the SCA and city together, and were about to be launched. We had about two weeks warning. 1. The need to enlarge and upgrade Luxor's infrastructure and antiquities site facilities to accommodate radically expanded tourism, east and west bank. 2. The encroachment of the modern community on antiquities sites, east and west bank. 3. The excavation and development of new antiquities sites (like the sphinx road between Luxor and Karnak temples) for tourism, but which (the thinking goes) will also safeguard the sites from future encroachment. Deep below the Egyptian desert, archaeologists have found evidence of yet another pyramid, this one constructed 4,300 years ago to store the remains of a pharaoh's mother. That makes 138 pyramids discovered here so far, and officials say they expect to find more. Tourists will, no doubt, care. Egyptians probably will not, unless they work in tourism. But for citizens and foreigners alike, there is no escaping the truth that Egypt is inextricably linked in the public consciousness with pyramids, especially the Great Pyramids of Giza. The nation's premier newspaper is called Al Ahram, or The Pyramids. Egypt's best-known research center is the Al Ahram Center for Political and Strategic Studies. Yet living in the shadow of past greatness is not always easy. The pyramids are proof of Egypt's endurance and what distinguishes it from modern confections, like Saudi Arabia, a nation founded 76 years ago, named after a family and built on oil wealth. But these monuments to Egypt's early ingenuity are also an ever-present symbol of faded glory. It is hard to escape comparisons between an Egypt that once led the world in almost everything and modern Egypt, where about 40 percent of the population lives on $2 a day. Forty-five tribes have populated Egypt's deserts for millennia and yet their existence remains a mystery to the country's urban masses. The Characters of Egypt Festival aims to showcase their ways of life. There were people in every corner. The office tent was packed, cheers and loud clapping emanated from the main tent, accompanying vaguely familiar tunes. Circles of guests, cosily arranged around large cushions, dotted the vast grounds while a large bonfire attracted caffeine addicts awaiting the next round of ginger-spiced beverages. Footsteps were audible to and from the kitchen, bathrooms, kids corner, audio-visual conference centre and museum -- all housed in beautiful white tents -- while buses, jeeps and sedans constantly loading and unloading guests rendered the 6km off-road stretch connecting Fustat to the Marsa Alam highway almost in need of a traffic coordinator. This event is big. Bigger than I thought, I mused to myself as I quietly assumed the role of social butterfly once Yassine had run off to see if the camels were still awake, each of us attempting, his own way, to imbibe the floating energy before selecting a spot to settle down. years -- raising 2-ton blocks to its top. his computer models depicting what he had figured it out. When the tomb of King Tutankhamun was discovered in 1922, Tutmania gripped the public like a fever. The temperature spiked again in the 1970s with the tour of “Treasures of Tutankhamun,” which bypassed a disappointed Atlanta. Get the cold compress ready: It’s our turn now. “Tutankhamun: The Golden King and the Great Pharaohs,” a new exhibition, begins its U.S. tour at the Civic Center today, and it’s terrific. Too often big exhibits intended for a broad audience are more Hollywood than art. Not this one. Yes, it’s dramatic. Arts and Exhibitions International, the organizer, has deployed a full artillery of effects, from pin-point lighting in darkened spaces to video fly-throughs, to create a memorable experience. But never at the expense of the artifacts. The 130 objects from The Egyptian Museum in Cairo are the stars of the show, and they are top-notch. The museum and curator David Silverman worked together to select an array that represents the artistry and range of ancient Egyptian arts and crafts. Majestic pharaohs carved from obdurate stone. Vessels carved out of milky Egyptian alabaster. Birds fluttering in the marsh painted on a palace floor. The objects tell a story, too. The exhibit is a TUTorial (to steal the Carlos Museum’s term) on the pharaohs who ruled ancient Egypt. The roll call of mighty kings in the first gallery is followed by chapters on their courtiers, families, religious beliefs and, of course, their elaborate funerary rituals. A rare 2,500-year-old Egyptian sarcophagus shattered in a student protest almost four decades ago is expected to be a whole, new artifact when it returns to its home in Montreal after a sojourn in Gatineau. The elaborately-painted Hetep-Bastet coffin and the mummy inside are on loan to the Museum of Civilization, which plans to hand the ancient wooden coffin back to its owner, the University of Quebec in Montreal (UQAM), in far better condition than when it left. Over the past three months, conservators at the museum have been painstakingly piecing together a few large pieces and hundreds of tiny fragments broken from the lid and the back of the coffin during a violent student protest in 1969 at the École des Beaux-Arts de Montreal, which received the coffin as a gift from the Cairo Museum in 1927. “Unlocking the Great Pyramid” (8 p.m. Sunday). So the Egyptians just used a giant ramp to cart those 2-ton stones up to the top, right? Actually, there’s no way that happened, despite what you saw in the movies. In this program Nat Geo contributor Bob Brier teams up with French architect Jean-Pierre Houdin, who in early 2007 announced he had figured out how the Egyptians got their rocky mountains so high. Using sophisticated software, he could show how workers carted those stones to a height of nearly 500 feet above ground. Brier — who has been Houdin’s biggest champion in the English-speaking world — is an eager co-conspirator and an enthusiastic guide. He’s able to turn this seemingly dry scientific story into one of those whodunits where the detective is personally invested in solving the case. Other ancient mysteries airing later in “Expedition Week” are the mummy caper “Mystery of the Screaming Man” (8 p.m. Friday) and “Herod’s Lost Tomb” (8 p.m. Nov. 23; yes, the “Week” is actually eight days). In this useful and interesting study of provincial Egypt, Tomasz Derda has set himself the far from moderate task of disentangling the complex and fragmented papyrological evidence relating to the formal aspects of Roman administration in the Egyptian Fayum. The book grew out of his engagement with the project of Willy Clarysse on "Fayum villages in the Graeco-Roman Period" (p. XII) and as such reflects the classic concerns of papyrology. First and foremost, this is a study of the formalities of state administration; the emphasis is heavily on clarifying the use of administrative terms which scholars encounter in the numerous surviving documentary papyri in order to chart the nature of administrative units and offices. A more penetrating analysis of the relations of power underwriting Roman rule in Fayum society, on the other hand, is not really attempted, though Derda does occasionally offer some interesting observations on this topic too. Conceived as a study of formal administrative divisions and their chronological developments from late Ptolemaic times till the 4th century, the structure of the book is more or less given. The introduction and Chapter 1 set the scene and situate the Fayum as a somewhat aberrant case within the administrative organisation of the province of Egypt. Then follows a survey of the administration over four chapters each dedicated to clarifying the character of a specific kind of office and administrative division. Finally a conclusion summarises the results. Archaeologists have discovered a new pyramid under the sands of Saqqara, an ancient burial site that remains largely unexplored and has yielded a string of unearthed pyramids in recent years, Egypt's antiquities chief announced Tuesday. The 4,300-year-old monument most likely belonged to the queen mother of the founder of Egypt's 6th Dynasty, several hundred years after the building of the famed Great Pyramids of Giza, the country's antiquities chief Zahi Hawass said as he took the media on a tour of the find. The discovery is part of the sprawling necropolis and burial site of the rulers of ancient Memphis, the capital of Egypt's Old Kingdom, about 19 kilometers (12 miles) south of Giza. All that remains of the pyramid is a square-shaped 16-foot (5-meter) tall structure that had been buried under 65 feet (25 meters) of sand. "There was so much sand dumped here that no one had any idea there was something buried underneath," said Hawass. Hawass' team has been excavating at the location for two years, but he said it was only two months ago when they determined the structure, with sides about 72 feet (22 meters) long, was the base of a pyramid. They also found parts of the pyramid's white limestone casing -- believed to have once covered the entire structure -- which enabled them to calculate that the complete pyramid was once 45 feet (14 meters) high. The splendors of Tut’s tomb are just the beginning. Behind the golden facades lies the story of the boy king of Egypt, and also a story of the excavation of his tomb, thousands of years later. This is the prime focus of Wonderful Things: The Harry Burton Photographs and the Discovery of the Tomb of Tutankhamun, the sister exhibition to Tutankhamun: The Golden King and the Great Pharaohs, and opening at the Michael C. Carlos Museum Friday. A virtual recreation of the River Nile will soon greet visitors arriving at Turin's world-renowned Egyptian Museum as part of a sweeping makeover announced on Monday. The virtual waters will flow alongside the escalator leading up to the museum, thanks to the technical wizardry of Oscar-winning set designer Dante Ferretti. ''Visitors will immediately get the feeling they are travelling up the Nile, before entering the new museum complex,'' said the head of the Egyptian Museum Foundation, Alain Elkann. The virtual river is just one of the projects included in the 50-million-euro overhaul of the museum, which houses more ancient Egyptian antiquities than anywhere else in the world bar Cairo. The entire layout of the museum's exhibition space will be restructured and reorganized, increasing the available space from 6,000 to 10,000m2. Friday, November 21, 2008, 6:30 P.M. Location: Benjamin T. Rome Auditorium, the Johns Hopkins School of Advanced International Studies, 1619 Massachusetts Avenue, NW, Washington, DC. Lecture Summary: The Hibis temple sits at an advantageous geographical and historical crossroads. Geographically, it is located relatively far from Nile Valley; it was built in the city of Hibis, in the Kharga Oasis, the largest oases in the western desert of Egypt. The city of Hibis was the center of the ancient trade routes between the Nile Valley, the Egyptian and Libyan oases further to the east and the famous southern markets in Sudan and Ethiopia. Historically, the major parts of the temple belong to the Persian period, the time of Darius the great around 510 B.C.E. It is almost the only considerably well preserved temple that survived from the period 1100 - 300 B.C.E. Of that period, nothing in the Delta or in Thebes equals or even comes close to the Hibis temple with its beautiful state of preservation. The temple is dedicated to the god Amon of Hibis but there are ample layouts for other cults as well. The aim of the ongoing study of this temple is to investigate the symbolism and meaning of its rich decoration and to see how Hibis stands in relation to earlier and later temple theology. The analysis of certain chapels to the south of the main sanctuary as well as on the roof of the temple will be particularly discussed. These chapels, which likely served as reception or residence halls for the gods of the temple, show the distinguished local cult of Hibis. In contrast to the universal character of the decoration of the main sanctuary, those of the surrounding chapels emphasize the temple’s own dogma. They also indicate the rites that predominate throughout the temple. Speaker: Fatma Ismail is a PhD student at the Near Eastern Department of the Johns Hopkins University in Baltimore. She finished her undergraduate studies and a preliminary master's degree in Egyptology at Helwan University in Cairo. Her dissertation topic was on the iconography and meaning of the decorations of the Hibis Temple. She presented two talks on this subject at the Annual Meeting of the American Research Center in Egypt in 2006 and 2008. For many seasons, she has been a field member of the annual excavation of The Johns Hopkins University Expedition to the Temple Precinct of the Goddess Mut at Karnak. She worked on the following important exhibitions: “Faces of Ancient Arabia The Giraud and Carolyn Foster Collection of South Arabian Art” and “The Eternal Egypt Exhibition: Treasures from the British Museum” in the Walter’s Art Museum; and “Quest For Immortality: Treasures Of Ancient Egypt” at The National Gallery of Art, Washington D.C. Additionally, she contributed several entries to the unpublished catalogue of the Egyptian Art collection at the Walter’s Art Museum and to the database of the Archaeological Collection at Johns Hopkins University. Thanks so much to everyone for all your good wishes. They are genuinely appreciated. I have printed them off to show my mum because I know that they will lift her spirits. I can't thank Ben enough for taking over in my absence - and already doing a fantastic job. Ben, you are terrific. It will seem funny to keep up on all the Egyptology news whilst I'm away by reading this blog rather than writing it! Thanks again to everyone and keep well. The width of the Nile Corniche boulevard in Luxor is to double as part of a development plan that is now steaming ahead at full speed. Egyptologists and concerned Luxor residents regard it as a terrible loss of historical 19th-century buildings and other structures on the town's riverside esplanade, but several such landmarks are being demolished to make way for increased traffic between the two major temples on the east bank. Meanwhile letters have been flying back and forth on Internet blogs. "If the current plan is implemented, this zone will be at the expense of buildings, and gardens in front of buildings, including those of a military club, a mosque, a Coptic Catholic rest house, and Chicago House garden. Can a less radical plan not be drawn up?" writes one anxious party. The Big Question: What is a World Heritage Site, and does the accolade make a difference? A United Nations team is about to visit Bath to decide whether the city still deserves the accolade of a World Heritage Site. There are 28 such sites in Britain but Bath is the only entire city to be listed. But the heritage police are worried. They originally called Bath "a city that is harmonious and logical, in concord with its natural environment and extremely beautiful". But now they fear this might be spoiled by a new development to which the city council's planning committee has given outline permission. It will add 2,200 houses with shops, a school and a park right next to the River Avon. Some of the buildings are nine storeys high. Enthusiasts for the scheme attack those who would keep Bath as "a city in aspic" and worry that the whole project may be at risk if the United Nations Educational, Scientific and Cultural Organisation (Unesco), which grants world heritage status, disapproves. What kind of places are given the accolade? Anything from a city to an individual building, monument, area, forest, mountain, desert or lake. There are currently 878 world heritage sites which include 678 listed for cultural reasons and 174 lauded as wonders of nature. These include the Great Barrier Reef, the Serengeti Desert, the Pyramids of Giza, the Statue of Liberty, the Great Wall of China, Mount Kenya, Edinburgh's Old and New Towns, Hadrian's Wall, Stonehenge, Memphis and its Necropolis, Persepolis, the Palace of Westminster, the centre of St Petersburg, the Banaue rice terraces in the Philippines and the Chhatrapati Shivaji Terminus railway station in Mumbai. The country with the biggest number of sites is Italy, which has 43. In 1954, the desert valley containing the twin Abu Simbel temples – which were carved out of a mountainside in southern Egypt in the 13th century BC on the orders of the Pharaoh Ramesses II – were about to be flooded by the building of the Aswan Dam. Frustrated by the Egyptian government's lack of action to protect the ancient buildings, Unesco launched a worldwide campaign that saved the temples by relocating them to higher ground at a cost of $80m, half of it collected from 50 countries. On a scorching hot day at the end of June 1886, Gaston Maspero, head of the Egyptian Antiquities Service, was unwrapping the mummies of the 40 kings and queens found a few years earlier in an astonishing hidden cache near the Valley of the Kings. The 1881 discovery of the tombs, in the Deir El Bahri valley, 300 miles south of Cairo, had been astonishing and plentiful. Hidden from the world for centuries were some of the great Egyptian pharaohs - Rameses the Great, Seti I and Tuthmosis III. Yet this body, buried alongside them, was different, entombed inside a plain, undecorated coffin that offered no clues to the deceased's identity. It was an unexpected puzzle and, once the coffin was opened, Maspero found himself even more shocked. There, wrapped in a sheep or goatskin - a ritually unclean object for ancient Egyptians - lay the body of a young man, his face locked in an eternal blood-curdling scream. It was a spine-tingling sight, and one that posed even more troubling questions: here was a mummy, carefully preserved, yet caught in the moment of death in apparently excrutiating pain. He had been buried in exalted company, yet been left without an inscription, ensuring he would be consigned to eternal damnation, as the ancient Egyptians believed identity was the key to entering the afterlife. Moreover, his hands and feet had been so tightly bound that marks still remained on the bones. Who could he be, this screaming man, assigned the anonymous label 'Man E' in the absence of a proper name? The mission was to bring freedom and regime change to the Arabs. It ended in disaster. I'm referring, of course, to Napoleon's invasion of Egypt, which eventually led to the French army's surrender to the British. No sooner had they pulled out, than France was gripped by Egyptian fever. Sphinxes, hieroglyphs, and lotus leaves proliferated on furniture, jewelry and china. Classical scholars watched in dismay as Egyptology became the preferred discipline in the scientific community. A show at Paris's Institut du Monde Arabe displays the many cultural fruits of the Egyptian invasion. ``Bonaparte et l'Egypte -- Feu et Lumieres (1769-1869)'' spans the century that began with Napoleon's birth (and that of Muhammad Ali, founder of the dynasty that ruled Egypt until 1952,) and ended with the opening of the Suez Canal. Some 350 objects are displayed in more or less chronological order, starting with the fantastic ideas that 18th-century France entertained about the land of the pharaohs. The freemasons, for instance, copied what they believed were pharaonic rituals. Adel Saad Mondy, who has a degree in archaeology, is a new inspector with Egypt’s Supreme Council of Antiquities, the agency which issues permits to excavations. The Supreme Council of Antiquities arranged for Mondy and several other inspectors to do their first field training with the Fayum excavation. "These are some of the most important days of my life. It is my second day in the American field school at the archaeological site of Karanis in Fayum, where I am one of the Egyptian Supreme Council of Antiquities (SCA) inspectors training in this program. During the last two days I felt like I would be changed and that the field school would affect my archaeological work in the SCA. I took my first steps towards the scientific excavation process, including the recording of and working with a stratigraphic sequence. During these two days, I learned how to set up the automatic level and take elevations, and the importance of these levels for excavation and recording. Also, I started an archaeological drawing using the triangulation method. Actually, I greatly enjoy this field school program. It is very organized and connected between the field work and the theory lectures in the expedition house. I hope that all Egyptian archaeologists will have this chance to learn the scientific excavation steps and add new experience to the SCA." Andrea Vianello summarises a few points discussed during this event held in Cairo at the end of October 2008. Introduction to the conference: Kim Duistermaat stressed the need for archaeology to be relevant to the modern world and how this conference was an example of this. Intercultural contacts are a hot issue of our world, and both the Arab and “Western” cultures historically originated on its shores and have co-existed for millennia. Looking to a common past is therefore a good way to start a dialogue and see how different cultures can coexist. The EU supported this view sponsoring the conference. A few presenters (starting with Susan Sherratt) recalled the recent idea proposed by French President Nicolas Sarkozy of a Mediterranean Union suggesting that it happened several times in the past, and, at least culturally, the dialogue between different cultures in the Mediterranean never stopped. Maintaining the distances with the current political projects, it seems however that archaeology can make the difference in prompting dialogue and be part of the intercultural contacts that were mentioned so much during the conference. Chronology: Prof. Manfred Bietak is running a long-term project on this issue, SCIEM, and has collected much of the available information. Results from the project are being published, but it was useful on this occasion to see them discussed. In short, Bietak has still many problems in synchronising the many relative chronologies of the eastern Mediterranean, and the joint chronology that is slowly taking shape at least using part of the available contexts disagrees with C14 results. DNA studies: Dr. P. Perkins presented a paper reviewing the substance behind the claims that the Etruscans have an eastern origin as suggested by Herodotus. The mass media put some enthusiasm on the news, and Dr. Perkins reviewed what was the origin of that claim and what is its validity for archaeologists about one year later. The origin were two papers based on genetic (i.e. DNA) studies on modern populations. One study focused on the human population at Murlo, and a second one focused instead on bovine DNA. They prove that people and animals from the Near East eventually ended up in Italy at some point in time. Exactly when the geneticists cannot say, explained Perkins, and considering that people and animals moved around the Mediterranean well before the Etruscans (a direct connection between Near East and Italy can be made as early as the Late Bronze Age) and many times after them, the research appears pointless from an archaeological point of view. Late Bronze Age exchange network: Diamantis Panagiotopoulos and Gert Jan van Wijngaarden in separate presentations have emphasised how dynamic the network was and how it adapted on a region by region case. Panagiotopoulos looked at the reasons for the network to exist as it did: a lower dependency on governing elites (weak ties of an open network in his language) boosted its dynamism. Van Wijngaarden instead focused on Egypt, and showed how thing changed in that area throughout the Late Bronze Age. He interpreted the Aegean-type pottery from Egypt as exotica (it is not the only region of the Mediterranean where this is the case), and could interpret the efforts to procure this pottery as strategies to acquire exotica. Marie-Henriette Gates and Andrea Vianello (also in separate papers) considered the unifying reason that prompted and fuelled the Bronze Age network. Gates emphasised the economic reasons while Vianello, agreeing with Gates on the fundamental importance of the economic motivations for the exchanges, looked also at the social implications that the network had. The network is a very complex phenomenon indeed and it might be conceptualised as an experimental lab that gave to birth to what will become known as Mare Nostrum. This is a superb book. Wilkinson has brought together some of the current leading Egyptologists to produce a single volume work that introduces the reader to the methods and theories used in the study of ancient Egypt. All aspects of Egyptology are covered from the Egyptian language and medical research to the way archaeologists survey sites and the conservation of artefacts. The book is organized thematically into four parts (approaches, monuments, art and artifacts, and texts), with each part comprising three chapters. Wonderfully illustrated, this book will make excellent reading for students of the ancient world and the interested public. The volume opens and closes with succinct essays by the editor on the past, current, and future status of Egyptological research. 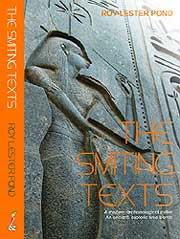 Wilkinson introduces the reader to the reality of modern Egyptological practice and research, pointing out that the latter part of the twentieth century has seen the study of Egyptology benefit from broader methods of scholarship taken from the arts and humanities, and the natural and medical sciences. Egyptology is now very much an interdisciplinary field. The Supreme Council of Antiquities has left no stone unturned to retrieve three stolen items from Spain as an SCA delegation will finally leave for Barcelona tomorrow to have them back. Dating back to the New Kingdom, the pieces - a basalt statue of an unknown man, a fragmentary granite statue of an Egyptian noble man and part of a color-decorated wall of the tomb of Ken-Amun - had been smuggled out of Egypt, said SCA Secretary General Zahi Hawwas. They have been on display at the Museu Egipci de Barcelona, before the SCA learned about them in 2004. The council then sent a committee to examine the looted pieces, confirming the SCA doubts; all three items are originals. But the museum would not give them back and the SCA, having run out of all diplomatic means, launched legal action. It was only then that the museum gave in to the SCA demands. The museum management pleaded with the council to supply it with imitations to showcase them in place of the three antiquities. Egypt has retrieved more than 5,200 stolen antiquities in recent years. I believe I speak for Andie when I thank you for all your comments showing your support at this sad moment. When I had the first chance to update Egyptology News I felt then (as I do now) that it was a great responsibility. I even joked to Andie about how difficult the task would be to fill her shoes ( "I hope they are not high heels"). But thanks to her kindness and the special help of Kat Newkirk, I was able to assume that responsibility. I will voluntarily contribute to the site with the same sense of responsibility and dedication at that first occasion. Please continue to show your support and let's hope we have Andie Byrnes back soon. Apologies to all visitors but I am temporarily moving from London to north Wales due to the illness of my mother, and will not be in a position to udpate the blog for the forseeable future. I will of course begin to update it again at some point in the future, although I have no way of predicting when. Certainly not until next year. I will send an email to EEF when I resume posts. My thanks to everyone, and particularly to Kat Newkirk, Chris Townsend and Ben Morales-Correa. The Egyptian Museum in Tahrir Square, with its deep-rose, neo-classical façade, has stood as one of the city's most familiar landmarks since its construction in 1902. It is home to 150,000 of the nation's most important artefacts from a long and unique span of Egypt's history. Over the last two centuries, however, the rapidly increasing numbers of discoveries resulting from excavations all over the country have overwhelmed the museum's galleries. The huge size of the ancient Egyptian collection means that thousands of pieces remain in the museum storerooms. Within the framework of the drive by the Ministry of Culture and the Supreme Council of Antiquities (SCA) to preserve Egypt's priceless treasures, both stored and newly-discovered, to create the best environment in which to display them, and to release the pressure on some overstuffed provincial museums, the Egyptian Museum was placed at the top of the list. The launch of the construction scheme of the planned Grand Egyptian Museum (GEM) overlooking the Giza Plateau has also spurred a sprucing up of the museum and its renovation plan. Ben has updated his blog with a story being carried by CNN Traveller. Here's a sample. Modern Alexandria sits on top of two great civilizations. A battle to reclaim its past and to build according to Alexandria’s rich cultural heritage is led by Dr Mohammed Awad, architect, historian and director of the Alexandria & Mediterranean Research Center. His campaigning has earned him respect and enmity in about equal measure. His most controversial action was to promote the idea of erecting an equestrian statue of the city’s founder, Alexander the Great. Designed in Greece and presented as a gift by various Greek associations in 2000, the monument enraged many Egyptians who – only 2,331 years on from the event – still viewed the Macedonian as an imperialist conqueror. Another of Awad’s notable campaigns was in the mid-1990s when he took a stand against the bulldozing of the site where the city’s new library was to be built without prior archaeological excavation work. The library was the Bibliotheca Alexandrina, intended to revive the spirit of the lost Alexandrian library of classical times. Completed in 2002, it is a giant 160-meter-diameter glazed disc that emerges out of layers of history and tilts its face to the Mediterranean. Its solid granite drum is inscribed with characters from every known alphabet, some 120 scripts, while the great amphitheater of the reading room sits 2,000 readers. The library is only the second in the world to hold a full copy of the Internet Archive, which is a snapshot of every page hosted on the web between 1996 and 2006, or 1.5 petabytes (that is 1 followed by 15 zeroes) of data stored on 880 computers. This July it was host to Wikimania 2008, the annual conference for people involved in web-based Wikimedia projects. Last October the Bibliotheca celebrated placing its 555,555th book on the shelves (Euclid’s Elements, appropriately enough a product of the original Library of Alexandria). But Bibliotheca Alexandrina is far more than books. The hope is that the library can act as a catalyst for nothing less than an intellectual and cultural rebirth of the city. Thanks to David Gill for his post to the Ancient World Bloggers group re the broadcast of an ancient Egypt themed short story. An outstanding collection of the treasures of the State Museums of Berlin that honors the contributions of patron James Simon is now at the Legion of Honor until January 18, 2009. THE STATE MUSEUMS OF BERLIN AND THE LEGACY OF JAMES SIMON is a case study of the history of collecting during the late 19th and early 20th centuries and features approximately 140 works from nine separate Berlin museums. . . . This 18th-Dynasty sculpture was crafted during the reign of Amenhotep III. Standing nine inches, it is composed of Yew wood, silver, gold, lapis lazuli, and faience. It was a major purchase among James Simon’s Egyptian New Kingdom collection. The mother of Akhenaten, Queen Tiye is realistically depicted as middle-aged with furrowed brows. She possesses a regal and careworn look marked with an awareness of the power she wielded. This limestone head of Nefertiti, Akhenaten’s queen, comes from the same workshop of the Chief Sculptor Tuthmosis and was by the same hand as the famous Bust of Nefertiti. With black paint on its cheeks and face as sculptors’ guides, the head serves as a model for artists producing portraits of the queen. James Simon supported excavations in Amarna from 1911 to 1914. In 1912 large finds were uncovered in the workshop of Tuthmosis. Many years ago, when I was working as an inspector of antiquities in Luxor, I went one night by the light of the full moon with Sheikh Nagdi, head of the guards in the Valley of the Kings, to climb Al-Qurn, the pyramid-shaped mountain that rises above the valley. I went to sleep at the top of the mountain. At sunrise I opened my eyes and looked at all of the tombs in the valley from the top of the mountain, thinking about all the great discoveries that had been made there, and the many adventurers and archaeologists who had both good and difficult ones. When I came down to the valley, I found Sheikh Nagdi waiting, laughing and drinking tea. He said to me, "I have never seen anyone climb the mountain at night." I sat with him, and he began to tell me many stories about the archaeologists who had worked in the valley, including tales that his father, Sheikh Abdel-Maugoud, used to tell him. I even found out from him that Evelyn Herbert, the daughter of Lord Carnarvon, used to enter the tomb of Tutankhamun at night with Howard Carter. All of the books say that Evelyn loved Carter, but he did not return her affections. The sheikh's story, however, shows that this was not true at all. It should have been a luxury break in the Caribbean sun. Having forked out £3,500 on a three-week holiday in St Lucia, retired policeman Anthony Griffin and his wife Pauline were naturally excited as their plane touched down. However, as they passed through immigration, Mr Griffin was stopped and told there was an international warrant for his arrest over the theft of Egyptian artefacts. Instead of booking in to a plush hotel the couple say they were separated and thrown in filthy, rat-infested police cells for two days. The couple, from Gillingham, Kent, were the victims of an extraordinary identification blunder – but the error was not uncovered until they had been unceremoniously flown back to Britain. Just a quick note to let visitors know that I will be away in Wales for most of this week, but expect to be back for the weekend. I don't know if the blog's statistics are of interest to anyone but a few days ago the blog had its highest ever number of visitors on one day - a grand total of 818. Thanks to everyone for continuing to visit. 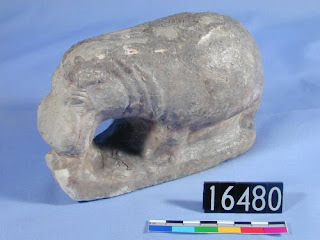 Painted limestone hippopotamus, trace of red paint and black lines. More re the restoration of the Philadelphia mummy. Lots of photographs accompany this post. The mummy was removed from its case on Friday, October 24, a rare treat for that day’s visitors. Second graders from the Broad Street School in Bridgeton, N.J. were amazed and had so many questions. All of the Academy’s visitors, now through November 1, can experience this once in a lifetime opportunity and get within feet of one of the Academy’s treasures. The conservators are hard at work but eager to answer questions from visitors who wander over to the work area. Akhmim mummy expert Jonathan Elias has a slide show running throughout the day featuring photos of a CAT Scan performed on the mummy several years ago at the University of Pennsylvania. The images allow the viewer to see beyond the wrappings and almost into the eyes of the young girl. It’s quite a sight, especially since we are so close to Halloween. Today, October 27, the group is focusing on the repair and stabilization of the sarcophagus. They are filling in gaps and losses that have occurred over time with various materials including a polyester, open-cell foam, pieces of balsa wood and a pasty, caulk-like material called glass micro balloons, which is a lightweight, inert, cellular filler. All of the materials that are being used for this project are removable, reversible and are causing no damage to the mummy or sarcophagus. National Geographic has posted a video to their YouTube channel today that presents supporting evidence of Jean Pierre Houdin’s internal spiral ramp theory, which suggests a system of corridors lay undiscovered inside the Great Pyramid. You can read more about Jean Pierre Houdin’s internal ramp theory in an article that that Vincent wrote earlier as part 5 of a series on how the Great Pyramid was built. A sizeable portion of the published texts from Alexandria consists of letters or administrative documents written from Alexandria to someone or other in the Nile Valley. They document in a unique way how a big city such as Alexandria was linked to the country that sustained it – the documents are the “life-lines” thrown out to the rest of Egypt to ensure a steady supply of food and taxes to sustain the capital and even the wider world beyond. Under Greek and Roman rule Egypt’s grain surplus supported a large urban population elsewhere in the Mediterranean. The most intriguing stack of texts, however, does not document the links between Alexandria and the rest of Egypt, but addresses directly what was going on in Alexandria itself. "It sounds like a bad joke. Eight Dogs, six cats and a baboon walk into a bar…." These are the words of Egyptologist Renee Friedman, describing her experience excavating a burial site in Hierakonopolis, Egypt, containing multiple animals that some believed served as guardians and protectors of the site. Friedman gave a lecture last night in the Smith Memorial Student Union to talk about the most recent discoveries in Hierakonopolis--a city about 400 miles south of Cairo that is often associated with the origins of Egyptian society. The city is the site of the first pharaohs, as well as the development of structures which the Egyptian pyramids were deliberately modeled after. Friedman is not your typical Egyptologist, however during the presentation she cracked some jokes, and called Hierakonpolis "the Milwaukie of upper Egypt." Friedman and a team of archaeologists spent the last 25 years investigating the site, which before 3100 B.C. (what is known as the Predynastic period in Egyptian history) was called Nekhen. Thanks to the OsirisNet October News page for the information that The Egyptological institute François Daumas, Montpellier University, has announced the launch of its online Egyptology publication, ENiM - Égypte nilotique et méditerranéenne, which will be issued in French. Articles will be available online or can be downloaded. L'Institut d'égyptologie François Daumas de l'Université de Montpellier est heureux de vous annoncer la création de sa revue d'égyptologie: ENiM. ENiM est la première revue française numérique d'égyptologie à comité éditorial. 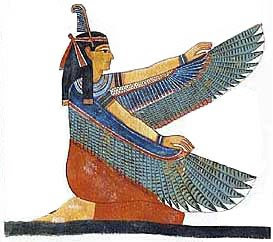 Elle est l'expression des activités de l'équipe « Égypte nilotique et méditerranéenne » de l'UMR 5140, « Archéologie des sociétés méditerranéennes ». Elle accueille aussi les travaux des autres membres de la communauté égyptologique internationale. Elle publie des travaux portant sur tous les aspects de l'Égypte ancienne, de la préhistoire à la période copte. ENiM a pour vocation de devenir un relais privilégié de la diffusion des connaissances de l'égyptologie grâce aux facilités et à la très grande accessibilité fournies par les Nouvelles technologies de l'information et de la communication (NTIC). ENiM est une revue entièrement gratuite et téléchargeable à partir du site de l'équipe « Égypte nilotique et méditerranéenne » de l'Université de Montpellier. ENiM est un périodique annuel composé de l'ensemble des articles successivement mis en ligne au cours de l'année, le volume annuel étant clos en fin d'année civile. - Jérôme Gonzalez, « À propos d'une confusion tardive dans l'emploi de wnn (être) et wn (ouvrir) », ENiM 1, 2008, p. 1-6. - Bernard Mathieu, « Les Enfants d'Horus, théologie et astronomie », ENiM 1, 2008, p. 7-14. - Frédéric Servajean, « À propos du temps (neheh) dans quelques textes du Moyen Empire », ENiM 1, 2008, p. 15-28. The lecture will be followed by a Reception in the Department of Archaeology. Registration will take place in the Department of Archaeology from 5.00 pm in the Birley Room of the Dept. of Archaeology. (see Bookings/Registration). Call for papers: Paper titles are currently requested for submissions to any of the proposed sessions; the deadline for title submission is Sunday 16th November 2008 and should be submitted by e-mail to the relevant session organiser (see Sessions). I haven't had a mummy's curse story for a long time. This one is a short story about the mummy of a singer of the priesthood of Amen-Ra at the British Museum. When ancient tombs were disturbed in Egypt, legends of fatal curses spread like wildfire. Whether such dark whispers were true or whether any tragedies surrounding such excavations were mere coincidence, the case of Exhibit 22542 at the British Museum may warn us not to take such sinister rumours lightly. The item in question is a mummy discovered in the latter part of the 1800s which, over time, harboured such an awful reputation that it was even blamed for the start of the war which broke out in 1914! The Egyptian mummy-case of a singer to the priesthood of Amen-Ra has allegedly caused thirteen deaths, although hardened sceptics would argue otherwise. The body was shipped to America in the early 1900s and the boat, the Empress of Ireland duly sank at St. Lawrence, and fingers were pointed at the mummy. Unlike other large shows of Egyptian antiquities I have seen, this one is not intended to inspire awe. It gives us a sense of how real people coped with the exigencies of life and aspirations in death. Because so much time is covered, we also see how many practices changed. And though it dwells on the nonrich a lot, most of the objects belonged to those with some means. The poorest people probably could not afford even a simple coffin. The Brooklyn Museum, which organized the show from its own enormous, world-famous collection, sent few objects made of precious metals and gems. But I really like the show. It has a clear mission and makes sense of the carved stones and old statues that tend to make our eyes glaze over in many antiquities shows. The wall labels are especially well done and the catalog, for sale in the museum store, has a wonderful essay about the cost of a funeral. See the above page for the entire review, with photograph. Was Cleopatra only a femme fatale or an ill-fated politician? Cleopatra has always been a player in other people’s dramas: she can be a coquette, a feminist, a martyr or a villain, a goddess or a fallen woman, even blonde or black. Horace called her the fatale monstrum—the fatal monster. Chaucer made her virtuous. Shakespeare turned her into a romantic heroine. Her nemesis, the Roman Octavian, called her a whore. It is that description—Cleopatra as a vamp, a seductress whose machinations led to the downfall of Julius Caesar and Marc Antony—that dominates the countless depictions in art, literature, theatre, film and history books. When she died in 30 B.C., she left no writings behind, and much of her city, Alexandria, now lies beneath the Mediterranean. But the shards of evidence the Egyptologist Joyce Tyldesley pieces together in her engaging new biography, Cleopatra: The Last Queen of Egypt, reveal why it is so easy to misconstrue her story. See the above address for the entire two-page review. We may sometimes classify misunderstood facts as being mysterious. I think that has been an important factor in the study of ancient Egypt. When skilled Egyptologists and archeologists are confronted with mega monuments that have no historical data to explain their existence they must use their research to come up with answers. They are very good at it but with no actual facts by which to compare results there is no sure way to know what the truth is. This leaves the door ajar for a lot of second-guessing and speculation. It also creates a fertile ground for debate. As far as I can tell from the rest of this page the author's main purpose is to speculate about the function of the Great Pyramid, but he also appears to consider how the pyramid was built and suggests locations for chambers that were used to store documents. 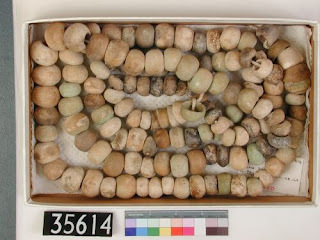 String of faience beads: one short cylinder, nine hemispherical (semi-cone), one hundred and twenty eight spheroids (balls); all with large perforations, some retain blue-green glaze, some are blackened, some eroded. It is impossible to give a flavour of this article by pulling out a few paragraphs from it, but here goes with a couple of extracts. Do go and read the entire thing if you want to find out what it's all about! Thomas Hoving is former director of the Metropolitan Museum of Art, and rarely expresses his opinion with brevity. A few weeks ago I received a letter from the Metropolitan Museum of Art’s chairman, James Houghton, saying that there’d be a major exhibition in October celebrating Philippe de Montebello’s three decades as director. Three hundred choice works from every Met department out of 84,000 acquisitions had been chosen by his devoted curators. To give you an idea how many 84K works is: that’s two-and-a-half times the 30,000 Egyptian pieces on view in the already overloaded galleries. It seemed to me nuts that the Met had gorged itself on 84K things knowing that further expansion up, out, down or wherever was impossible. Where would the stuff be stashed? I asked the museum’s publicity department if the phenomenal figure was accurate. Yes. Then at the press opening of the show -- "The Philippe de Montebello Years: Curators Celebrate Three Decades of Acquisitions," Oct. 24, 2008-Feb. 1, 2009 -- I collared director de Montebello and he assured me that the real count of acquisitions was closer to 5,000 or 7,000 and that the inflated figure took into account groups and series of works. Whew! For a moment there I thought the Met had secretly re-started its bizarre "new master plan" that envisioned a huge storage space to be blasted in the schist under Fifth Avenue costing a mere $650,000,000. A community action committee squashed that cockamamie scheme a few years back. . . .
After King Tut, the best known pharaonic celebrity of ancient Egypt is the radical king Iknaten, whose wife was the beauteous Nefertiti. He was the monotheistic ruler who reigned in the 18th Dynasty from ca. 1349 to 1336 B.C. He stamped out the old pantheon of the sun god, Amun, and replaced them with one god, Aten, the sun-god giver of life and the sun. Under Iknaten artistic style changed violently. Depictions of the Pharaoh –- slack-chinned, pot-bellied, with a grotesquely elongated head -– are among the most gripping in all of art history. His palace, now totally gone, was at Tel el Amarna. Excavations there have been going on for years and hundreds of limestone panels have been found; most of them have been for years in underground storage at the Talatat storage area. Somehow Schimmel got his hands on several dozen. One problem, however. The Iknaten hoard at the Met may become the Euphronios kalyx krater of the Egyptian department. According to Egyptian officials, the Talatat storerooms were broken into and hundreds of limestone panels stolen. Today, Egypt’s hard-charging head of antiquities, Dr. Zahi Hawass, is making lists of pieces in foreign lands he will insist on having returned to Egypt. Will the Iknaten pieces be listed? Will they go back? Stay tuned. Luxor News Blog - Jane is back! Brilliant News! 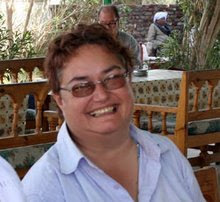 Jane Akshar is back, alive and kicking, and delivering great news items about life and archaeology in Luxor. Actually, she never went away. She moved blog addresses and I didn't realize. 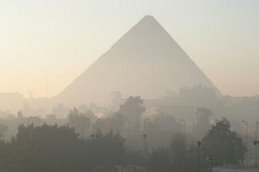 So she is up and running at http://luxor-news.blogspot.com/. Lovely to have you back Jane. I have her firmly installed in Google Reader now, so I won't be missing any more stories. She has posted so much recently that I can't list them all here, but here are some highlights. Do go to her site to see the rest. As usual, there are some lovely photographs to accompany the posts. This exhibition will focus on the extraordinary art created as a result of a sophisticated network of interaction that developed among kings, diplomats, merchants, and others in the Near East during the second millennium B.C. Approximately 350 objects of the highest artistry from royal palaces, temples, and tombs—as well as from a unique shipwreck—will provide the visitor with an overview of artistic exchange and international connections throughout the period. From Syria, Mesopotamia, and Egypt in the south to Thrace, Anatolia, and the Caucasus in the north, and from regions as far west as mainland Greece all the way east to Iran, the great royal houses forged intense international relationships through the exchange of traded raw materials and goods as well as letters and diplomatic gifts. This unprecedented movement of precious materials, luxury goods, and people resulted in a total transformation of the visual arts throughout a vast territory that spanned the ancient Near East and the eastern Mediterranean. Because many of these works have either only recently been excavated or have never been shown abroad, "Beyond Babylon" is a singular opportunity for the public to experience the rich artistic and cultural traditions of this period.